It's time to bring out our BEST in the 2017-2018 Best Robotics competition at POP! Shelton State Community COllege, in Tuscalooza, AL. Kick-off is Thursday, September 14th. 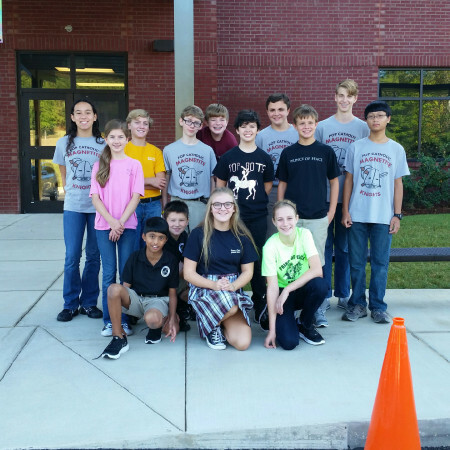 The POP Robotics team gets better every year and this fall the team reached a new level of performance, making it to the Regional Finals at Auburn University. An article in the local Hoover Sun newspaper explains their amazing year. To see more about the 2016 Robotics team, visit the student website at www.poprobotics.wordpress.com. Fifteen students shared ideas to build and compete against as many as 57 other teams using only the raw materials provided by the sponsors of the BEST Robotics program of Alabama. Girls and boys from 6th, 7th, and 8th grade participated. Veteran team members led the way through brainstorming sessions, programming, building the robot, and driving in the intense, 3 minute rounds of the competition. Students conducted research about Alabama farming and the use of robotics in agriculture, and build a marketing booth that highlighted the work of local farms and urban farming in Birmingham. Additionally, the team presented a marketing plan to a panel of professors at both competitions. The 20 minute presentation included cost analysis, community relations, strategic planning, and product construction of a "real world" version of the robot they built. The team's success culminated at the Regional Finals at Auburn University, a three day event filled with fun. Team members relied on each other and the talents of other teams to manage every aspect of their role in the competition. No adults were permitted in the pits, where students maintained and occasionally fixed problems with the robots. Hundreds of robotics students from five states worked together to ensure every team had the supplied they needed to keep their robot running at all times. Many teams provided treats for the other teams, like drinks and snacks, and even tools. The experience was like no other. The POP Robotics program is one of many academic areas focusing on students’ use of critical thinking to solve real problems. New middle school electives in STEM, such as coding and Myth Busters are just a few that help students use their interests to develop the thinking skills that will help them in every area of academics. to see our accomplishments from last year. Take a closer look at the Robotics Team achievements.